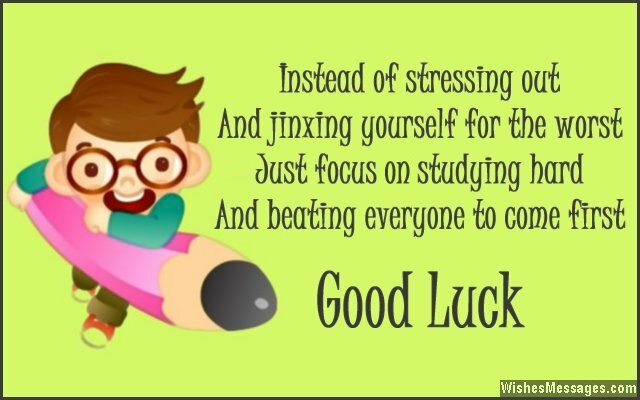 Good Luck Messages for Exams: For sons, daughters, friends, colleagues, boyfriends, girlfriends and besties – this post is a lovely hotpot of inspirational quotes and motivational notes crafted for anyone who is preparing for a test. If you know someone who’s buckling under the pressure of an exam, write something sweet on a card or post something encouraging on their Facebook. Do whatever it takes to help soothe the pre-exam jitters, nervousness and stress. Even something as silly as a funny text will go a long way. After all, it doesn’t matter whether it is a small school exam or something as important as the SAT, GMAT or the Bar. At the end of the day there is no greater motivation than knowing that your friends and loved ones believe in you and want you to do well. 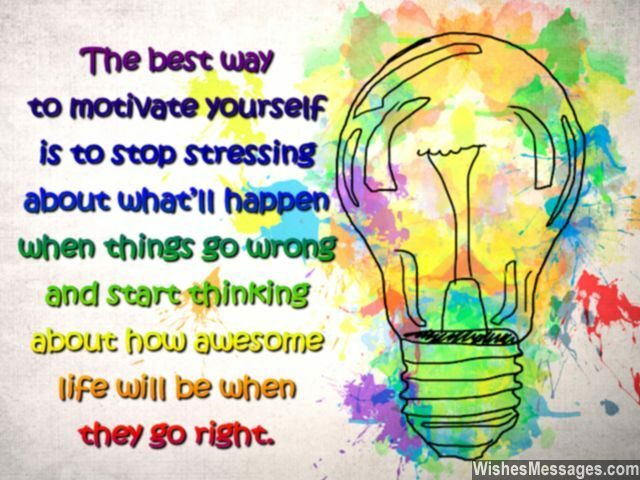 1) The best way to motivate yourself is to stop stressing about what’ll happen when things go wrong and start thinking about how awesome life will be when they go right. Good luck. 2) Exams are like ex-boyfriends and ex-girlfriends. Their thoughts harass you until late at night, turn your life upside down and cut you off from the rest of the world. All you can do is get over them as quickly as you can. Good luck. 3) As your girlfriend, it is my responsibility to wish you good luck for your exams with a hug and reward you with a sweet kiss if you do well. Here’s a hug and I hope that you earn your kisses. All the best. 4) The easiest way to do well in your exams is to treat them like a giant punching bag. Use all the strength of your memory and punch the daylight of your tests. All the very best. 5) Everyone knows you are the best student out there. All you need to do is work hard and revise with care. Good luck. 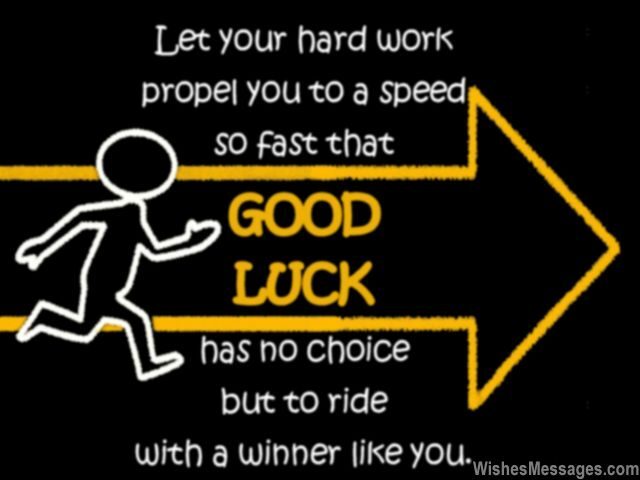 6) Let your hard work propel you to a speed so fast that good luck has no choice but to ride with a winner like you. All the best for your exams. 7) Nothing can stop you from doing your best, nothing can pull you down – as long as you start studying hard and stop fooling around. Good luck. 8) Don’t let shabby grades smear your beautiful personality. Good luck. 9) If you hate any of your teachers for giving you detention, this is your chance to get back them by scoring well and earning their admiration. Good luck for your exams. 10) If the stress of an exam is bringing you down, just think of studying hard as falling on a trampoline. The harder you fall, the higher you will rise. All the best. 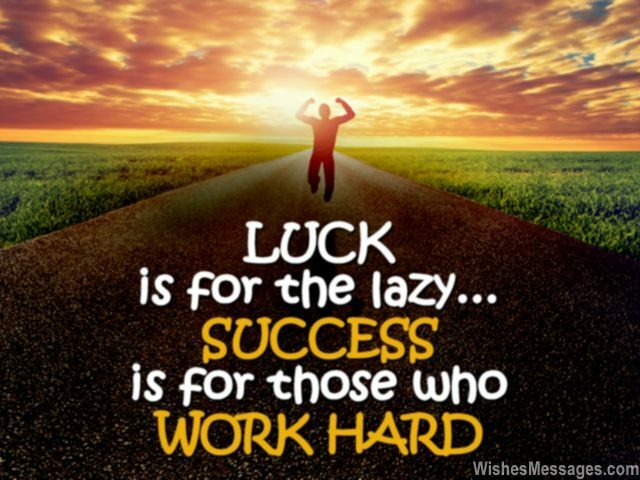 11) Luck is for the lazy, success is for those who work hard. 12) Exams don’t test your knowledge as much as they test your state of mind. Be relaxed and calm down, I am sure you will do fine. Best wishes to you. 13) Luck is a funny thing because sometimes it can be good and sometimes it can be bad. So take matters in your own hand, study hard and stop relying on something so fickle. All the best. 14) These exams are your opportunity at proving your worth to everyone around you. Grab it and do your best, don’t let it pass through. Good luck. 15) An exam is not just about finishing just another paper. It is a chance to do well and silence your naysayers. Good luck. 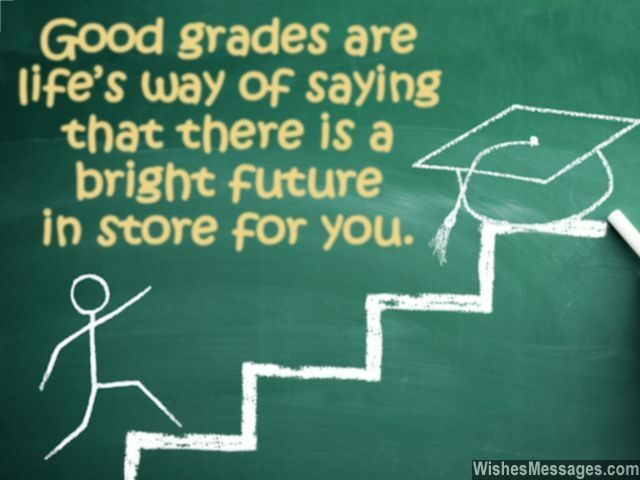 16) Good grades are life’s way of saying that there is a bright future in store for you. Good luck. 17) Do you want to know a secret way to get your parents to stop nagging, grounding and advising you throughout the year? Just do well in your exams. Good luck. 18) Luck chooses its recipients very carefully and it only comes to those who believe in themselves and those who are prepared to win. So be confident and don’t let the stress of your exams get under your skin. Good luck. 19) Every exam is a step on the ladder of your life. Do well so that you have something rock solid to hold it all together. Good luck. 20) Hundreds and thousands of people in the world give exams every day. Surely, something so common and ordinary can’t be too difficult. Good luck. 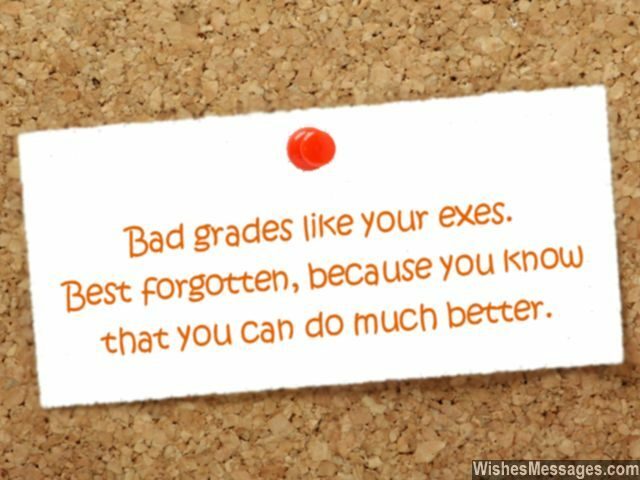 21) Bad grades like your exes. Best forgotten, because you know that you can do much better. All the best. 22) Make the most of your exams because it is the only time your parents won’t mind if you stay up all night at the pretext of studying. Enjoy and good luck. 23) You have the sharpest memory anyone has ever got, so ace your exams by giving it your best shot. All the best. 24) Do you worry about losing before you start playing ball with your friends? Then why worry about failing before you even start giving your exams? Good luck mate. 25) Good luck strikes when you least expect it too. Guess what, it just struck you with this message. All the best. 26) Nothing can come in-between you and your destiny, if you grab hold of every opportunity. Nothing can come in-between you and your fate, if you strive to be great. 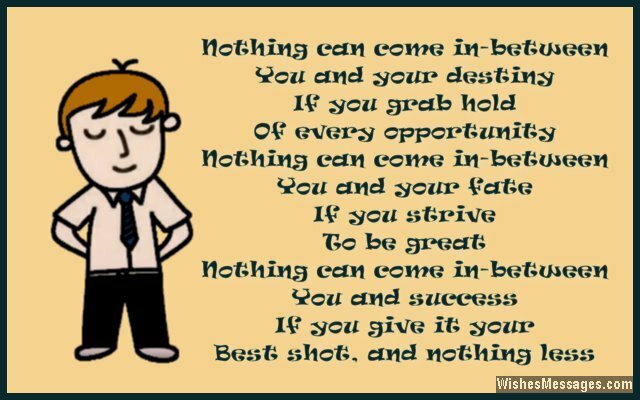 Nothing can come in-between you and success, if you give it your best shot and nothing less. Good luck for your exams. 27) Being successful in exams and tests is a simple two step process – believe in yourself and back it up with plain old hard work. Good luck. 28) Stop feigning nervousness before exams just so that you can get your friends to pamper you and reassure you that you are brilliant. xoxo. 29) Passing your exams with good grades will gradually make a strong foundation which will help you create rainbows even when you face severe storms in life. Good luck. 30) Don’t let these puny exams get in the way of your big dreams and ambitions. Save all the stress for bigger things in life. Good luck. 31) Instead of stressing out and jinxing yourself for the worst, just focus of studying hard and beating everyone to come first. Good luck. 32) If you don’t believe in yourself when you write your exams, how do you expect the examiner to? Have faith in yourself not just because it is the right thing to do, but because you are the best. Good luck. 33) Better grades can get you a better job, better car, and a better life. Exams are worth the trouble after all. Good luck. 34) In life, it is impossible to be 100% sure of whether you will pass or fail. But working hard is a sure shot way to increase your chances of doing well. Good luck. 35) I am not going to wish you good luck. Awesome students like you never need luck to be by their sides – they create their own destiny. Go for it. 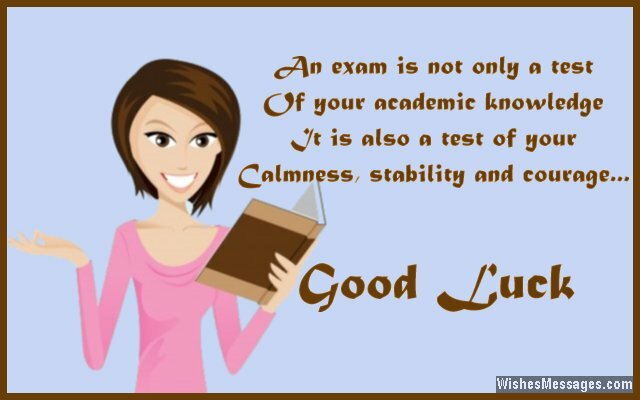 36) An exam is not only a test of your academic knowledge, it is a test of your calmness, stability and courage. All the best. 37) The real motive of exams is not to test your knowledge, but a way to remind you how brilliant and intelligent you really are. Ace your exams and prove your worth. Good luck. 38) Make sure you remember everything you study but don’t forget the most important thing – luck favors those who give it their best shot. Good luck. 39) Studying hard is the best form of luck that you can ever have. So what are you waiting for? All the best. 40) Exams may be compulsory but stressing out about it is a choice that isn’t. Good luck.